SoCal's first notable debut of the year is none other than Post & Beam, which soft-opened on NYE and which will celebrate its grand opening on the 10th. The restaurant represents a partnership between Executive Chef Govind Armstrong, Owner Brad Johnson (BLT Steak, Georgia, The Roxbury), and Director of Operations David Borrego (Wolfgang Puck L.A. Bistro, The Raymond), and is located, curiously enough, in the newly-renovated Baldwin Hills Crenshaw Plaza, right next door to the Debbie Allen Dance Academy. Baldwin Hills is one of LA's lesser known communities, and though it's home to a wealthy, largely African-American populace, the area is somewhat of a culinary wasteland: Post & Beam's nearest neighbors include Fatburger, McDonald's, Panda Express, IHOP, and the unfortunately-named "Downtown Buffet." About the Chef: Chef Armstrong was born in 1969 right here in LA, and was raised largely in Inglewood, as well as in Costa Rica. He began his culinary career in 1982 at the tender age of 13, spending three summer vacations working under Wolfgang Puck at the original Spago in West Hollywood. Following, he helped open Mary Sue Milliken and Susan Feniger's pioneering City Cafe on La Brea, then worked a stint at the Hotel Bel-Air. 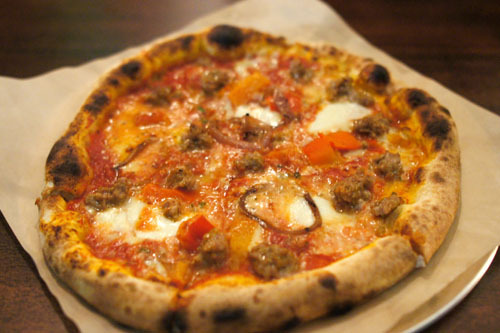 At this point, Armstrong left to San Francisco to attend college, and during his studies, he even sous cheffed at Puck's Postrio near Union Square. Later, he staged throughout Europe, cooking at Excelsior at Hotel de l'Europe, d'Theeboom, and The American Hotel, all in Amsterdam. He also toured Italy and France, and in the Spain, even apprenticed at Restaurant Akeláre under Pedro Subijana, and at Arzak under Juan Mari Arzak. Upon returning to the States, Armstrong went to work for Mark Peel and Nancy Silverton at Campanile, where he would meet his future business partner, Ben Ford. His tenure at Campanile was brief, however, as the Chef soon took over the kitchens at Jackson's, earning his first bit of critical acclaim. From there, Armstrong was poached by Joachim Splichal to cook at Patina, then at the defunct Pinot Hollywood. 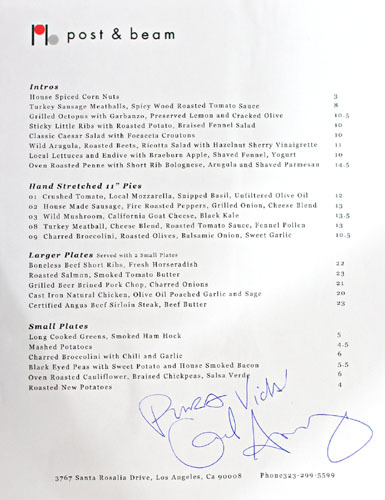 In 2000, the Chef partnered with buddy Ben Ford to open Chadwick in Beverly Hills at the site of the current Urth Cafe; Vinny Dotolo and Jon Shook even worked for them there. Though the restaurant was mostly well received, it ended up shuttering just two years later. 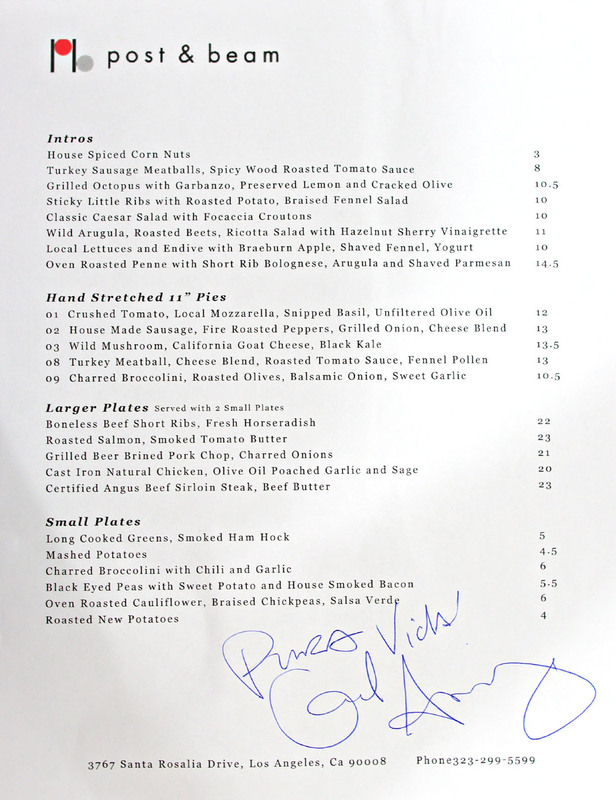 In 2003, Armstrong debuted Table 8 in Los Angeles, which firmly established him as one of the most influential chefs in the City. The restaurant closed in December 2006 for renovations by designer Thomas Schoos, around the same time that another outpost of Table 8 bowed in Miami at the Regent Hotel. The original location reopened in early 2007, but due to the questionable interior design, never seemed to regain its initial audience. As such, it was announced in May 2008 that Table 8 would close and relocate to another address: the former Chocolat space on the corner of Melrose and Kilkea (the current home of Red O). That, of course, never happened. What did happen was the conversion of the original Table 8 to 8oz Burger Bar, which opened in July that year. Meanwhile, back in Miami, another 8oz popped up in early 2009, followed by another in New York at the Cooper Square Hotel in May. Things, however, weren't looking as hot for Table 8 in Miami, which would end up folding just months later. And as if things weren't bad enough, Armstrong's business partner Josh Woodward was accused of murder and arrested in October. 8oz New York also shuttered by the end of the year. The original LA outpost would follow suit in March 2011. Things aren't all doom and gloom for the Armstrong camp, however. Two Horseshoe casino-based 8oz Burger Bars have been successful: the first in Bossier City, Louisiana (September 2010) and the second in Tunica, Mississippi (December 2011). A branch in Seattle's Capitol Hill is set to open any day now, followed by a North Miami location in February. And here in Los Angeles, Armstrong is planning to bring 8oz to Terminal 4 at LAX in the fall, while his old friend Ben Ford is opening Ford's Filling Station in Terminal 5. Of course, this is all in addition to the Chef's various TV appearances, including stints on Top Chef and Iron Chef America (where he lost to Bobby Flay in Battle Squash. ), as well as his very own cookbook: Small Bites, Big Nights (Clarkson Potter, 2007). Post & Beam's address formerly served as home to the Golden Bird fried chicken restaurant, but fortunately, that structure has been razed, paving the way for the new, 2,500sqft building. The space shows off a casual, mid-century modern-influenced flair, and features a wood-burning pizza oven, open-hearth broiler, and a 10-seater bar. Outside, there's patio seating, as well as an herb and vegetable garden. Post & Beam's menu aims to convey Armstrong's seasonal, California-inflected style, highlighting ingredients from the on-site garden as well as the South Central Farmers Cooperative. To drink, think a small, focused selection of wine and beer. Click for a larger version. To drink, we began with Eagle Rock Brewery's Manifesto [$6] on draught. 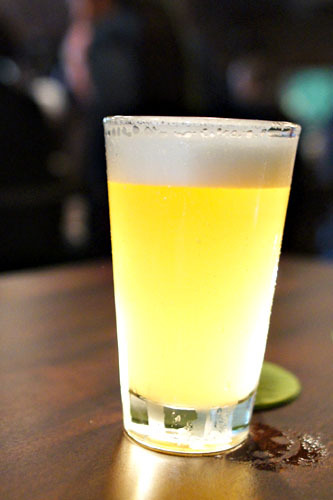 This was sort of a textbook witbier: wheat-y, but with marked notes of coriander and citrus. There was perhaps a touch of floral character, but I wanted something more pronounced, along the lines of The Bruery's Orchard White for example. 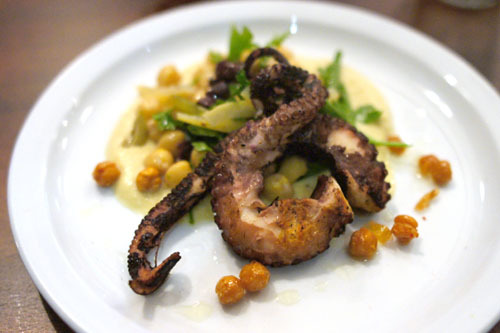 Given my penchant for octopus, this was naturally a must order, and the cephalopod did not disappoint, showing off a great chew and smokiness from the char. At the same time, I really appreciated the countervailing tang of the lemon and olive here, as well as the earthiness and texture contrast imparted by the chickpeas. 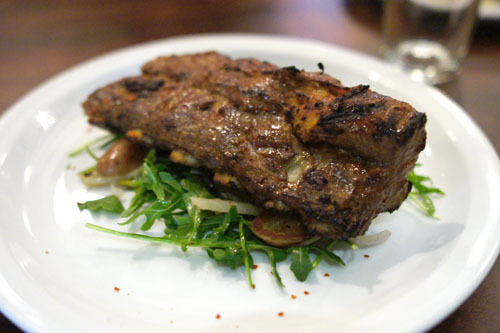 These little ribs weren't all that sticky, though they were nicely tender, with sort of a prototypical rib-y flavor. What I really liked here was the included salad of potato, fennel, and greens, which really did a great job in tempering the heft of the meat. 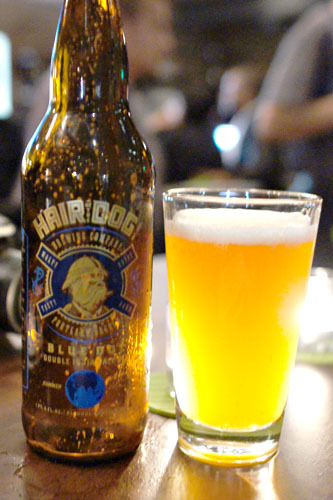 Since Post & Beam offers up free corkage on single bottles of beer, we brought along Hair of the Dog's Blue Dot Double IPA. This was actually much more restrained than I expected, with a good bit of citrus fruit up front to go along with some nice spicy and sweet, malty flavors. Short ribs were absolutely lovely, conveying deep, heady, bovine flavors balanced by notes of tangy tomato, bitter arugula, and savory cheese. Note that the pasta was pretty firm. I didn't have an issue with it, though I could see why some diners might. Pizza time. 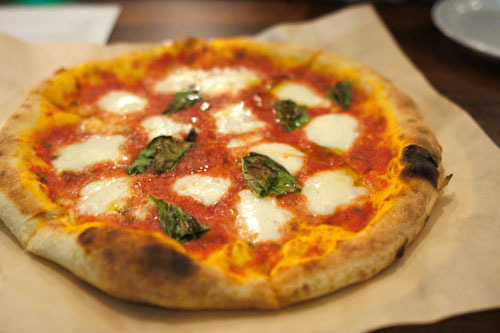 And what better way to start than with the restaurant's take on the classic Margherita? With only tomato, mozz, basil, and olive oil at play, the flavors here were very simple, familiar, yet thoroughly satisfying. Given the substantialness of the crust and its lack of astringency, I wouldn't necessarily classify this as a true pizza napoletana, but it was tasty nonetheless. The sausage pie was enjoyable as well, with some nice sugary notes from the onion and peppers to temper out the savoriness of the meat. I will note that my dining companion found the blend of cheeses utilized here overly piquant, though I had no such issues with it. 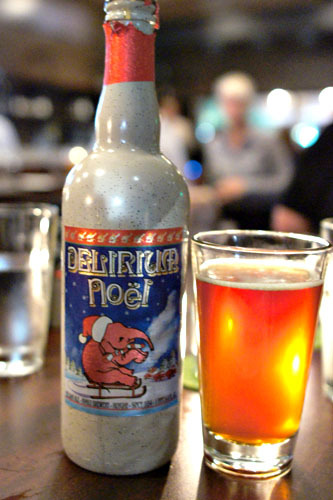 Along with the Blue Dot, we also had a bottle of Brouwerij Huyghe's Delirium Noël with us as well. I'm usually not huge into Christmas beers, but I rather enjoyed this one, with its delicious, sugary backbone laced with spicy notes and a subtle touch of alcoholic heat. Moving on to our mains now, we began with a butterflied breast of chicken. I quite enjoyed its hearty, herb-y relish, along with its delightfully crisp, salty skin, but unfortunately, the bird was dry in many places--what a shame. All of the larger plates come with your choice of two sides, and here we chose the long-cooked greens and the broccolini. 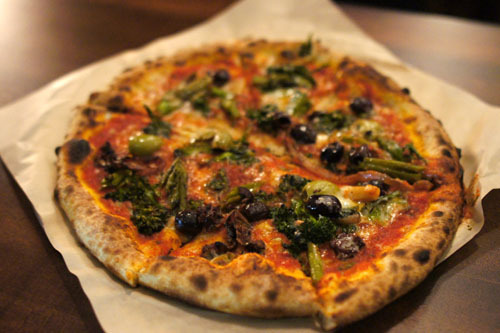 The greens were passable, with a very strong bitterness to them, but the real star was the broccolini, with its beautiful crunch and green, vegetal savor. 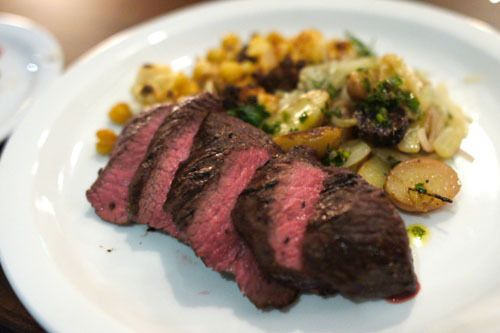 Beef, meanwhile, came expertly prepared, showing of a supple consistency and a good bit of beefy flavor. The steak paired beautifully with the roasted potatoes, and the cauliflower wasn't bad either, though I wanted to taste more from that salsa verde. We were seated at a communal table for this dinner, and the couple next to us graciously provided a taste of their pizza. 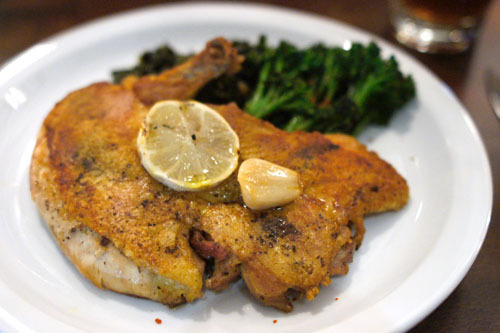 I adored the broccolini above with the chicken, and once again, it was the star of the show here as well. Its bitterness played off the tanginess of the olives perfectly, all while the balsamic balanced things out with its refined sweetness. Nice. 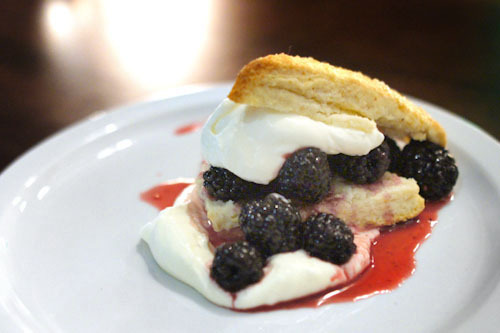 Desserts are still in work at Post & Beam, though we did get to sample a couple of them. 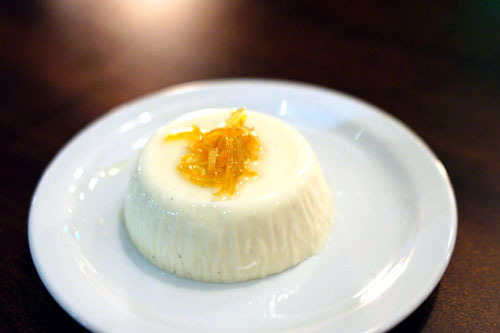 The panna cotta was light and bright, with a lactic tartness to balance out the otherwise lush nature of the dessert, while the candied fruit added some sour, sugary notes to the mix. Last up was this biscuit of sorts. Here, think classic berry flavors, intertwined with the luxuriousness of crème fraîche, all over a base of flaky, sugary crust. Certainly, the food here at Post & Beam is nothing groundbreaking or revolutionary. Instead, what we get is solid, straightforward fare, which was, for the most part, pretty satisfying. There were certainly a few kinks, but nothing that can't be worked out, especially given that the restaurant hasn't even officially opened yet. Service, fortunately, was on point as well, which is to be applauded. I have to give Chef Armstrong credit for having the courage to open up shop in such an out-of-the-way locale. It seems like the restaurant is a great fit for the community, and it'll be interesting to see how things play out in the future. I am glad to see you took my advice about Delirium Nöel! My husband and I are long time residents of Baldwin Hills and it is exciting to know that an Upscale Restaurant is coming to the Baldwin Hills area. We frequent the restaurants on the Westside & other areas of LA because there are no restaurants of high caliber in our neighborhood.The wording that The area is a "Culinary Wasteland" is due to the fact that Restaurant owners have not been in tune enough to know that people such as ourselves will spend money in our neighborhood and that we welcome restaurants that are not fast food or unhealthy. Also to earn our business the service needs to be excellent and we hope that you will have longevity in the neighborhood. Post & Beam! I'm already planning on bringing a group of 7 people on Saturday 1/14 if I can get a reservation! Michael: I thought of you when I purchased the bottle. Anon: Thank you for your comment--it's great to hear the perspective of a resident! Anon: Thanks for your interest in support of the restaurant! Please feel free to call the restaurant and ask for David Borrego. We will do our best to accomodate you and your friends! All hype, no courtesy from the front desk to management. My experience on Saturday March 31st was not a good one because I saw two parking spaces that stated "for to go patrons only", but when I arrived at the front desk to place an order "to go", they replied "no, we are to busy, we are not doing to go orders." and it was downhill from that point on. 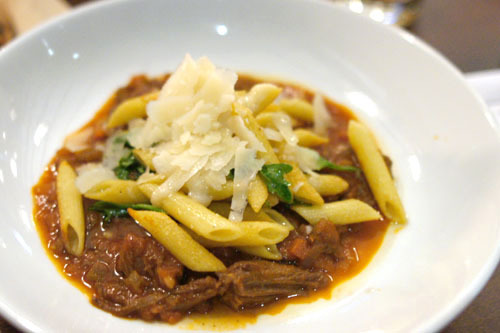 I was extremely disappointed because I had high hopes for the restaurant and was looking forward to sampling the food. As far as I'm concerned, The Parking Attendant was the most courteous person there. He was polite from the time I arrived, until the time he noticed my early departure. He asked me what I thought, and asked me very nicely to please come back and give the restaurant a second chance and because of him I might. Good luck. Did you ever go back? Personally I'm surprised that they even offer a to-go option. I remain indeed very excited﻿ about this restaurant being here in the Baldwin Hills Crenshaw Community. This is just the beginning believe me. Your spirit and energy will give encouragement to many new and exciting businesses. Thank God that Ken Lombard had the vision. As a Sculptor I look forward to working with Post and Beam to bring another added dimension to Post and Beam and that is one of my pieces displayed on the outer exterior of the restaurant.